Growth of aggregate demand at any given private saving rate depends on growth of private investment, export surplus and budget deficit. Slower growth of private investment in the mid-1970s has triggered stagnation trends in Europe's developed economies, caused mainly by inadequate aggregate demand. The relation between aggregate demand and the propensity to save is analysed in the present paper using the model of 'stunted growth' of Josef Steindl. The decreased utilization of capacity characteristic of stagnation can be counteracted by a reduction of the propensity to save. The most important factors determining the saving rate are distribution of incomes and the progressivity of the tax system. 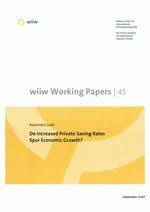 In many countries and periods, an inverse relation between the growth of GDP and of the private saving rate has been found and presented in the study.